Today's Lust for Less pieces are from the same store! As you may have heard, maxi skirts with a side slit are currently quite popular. 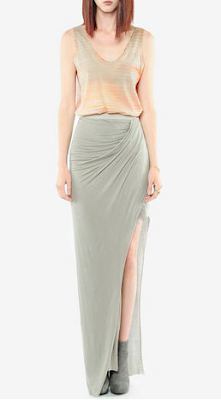 Well here are two options for you: This Helmut Lang skirt is in a beautiful pale green color and was originally $230, but is now on sale for $184at Tobi! If that's still too pricy for you, this skirt by Caribbean Queen is almost exactly the same and comes in black or grey for just $56 also at Tobi!